I cringe when I think back to the days I used the same password for every website I joined. My logic was that I needed to keep it simple or I’d never remember my passwords. My eyes are open now and I’ve seen the error of my ways. Now, I have a different password for every site and they are ones that there is no way I’d ever remember off the top of my head. I rely on a Password Organizer to keep track of everything. Frankly, I’d be lost without it! I was writing down the passwords on scraps of paper, but then I was losing them left and right. I moved to a notebook and it was an improvement. 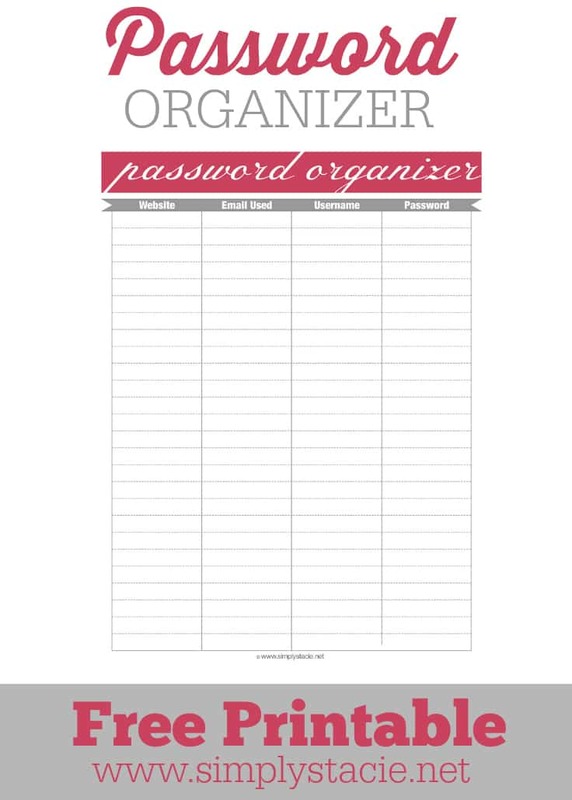 Then when I started working on my Household Binder to organize my life, I thought I’ll make a Password Organizer printable to record everything. It’s been working like charm! And good news, I’ve got one to share with you too, for FREE. Download this free Password Organizer printable to your computer and print it out at home. Record all your important passwords websites you visit frequently and ones you only go to once in awhile. I keep a copy with me at my desk so it’s within easy reach when I need to look one up. Before you go, check out this helpful post listing the top 50 passwords you should never use. Make sure none of your passwords are on this list. If you find some that you use, change them now! Don’t wait! And it terms of choosing a strong password, remember the longer the password, the stronger it is. If you like free printables, check out my other posts – Free Important Phone Numbers Printable, Free Grocery Shopping List Printable, Daily Cleaning Checklist, Spring Cleaning Checklist and a Weekly Menu Planner. 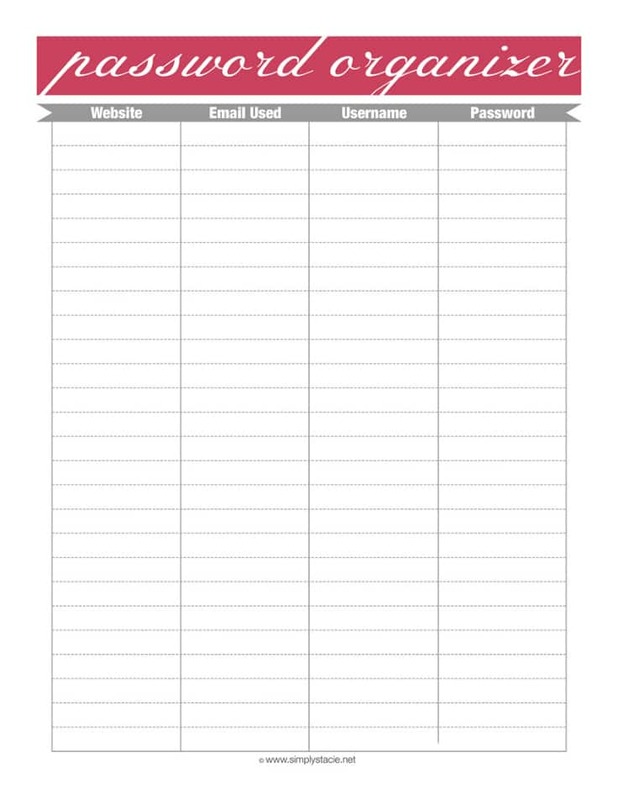 Fill out the form below to get your free Password Organizer printable. Always a huge problem for me, thank you! Oh Im totally printing this for my hubby and all of our bill passwords!! He is always making me remind him to pay our bills and I should really just do it myself lol!! Thank you!! I use the notebook system. I am downloading yours to try it out, thanks. I love this and I am going to print a few of the others as well, totally awesome! This will be so helpful, thank you! I am forever forgetting my passwords and really regret not keeping a spreadsheet like this! Lesson learned. I dunno, I’m not that organized. I have some word processing sheets, some scraps of paper, some notes on the phone. It’s a mess. I have my important passwords written down and I keep that written copy in a safe place. I like your printable, I may print out a few sheets. Thank you for sharing this password organizer printable. Thanks for sharing this handy reference. Thank you Stacie. This is awesome and will be well used. VERY helpful! I was guilty, like you, of using the same pass everywhere… and now I havea hard time keeping track of what password I used on what site as they are all different! Oy! This is really a great thing to print out and keep! Enven tho I have a password manager I also always keep a list of sites and important passwords on a paper copy like this one you have for us to use. I have saved it by the way. 🙂 to print out more copies later. Thanks for this, as everyone should keep one on hand as we don’t always remember passwords and if like me, I do change mine every now and then for security reasons. Popping over from My Turn for Us….great printable! Thanks!! I have this spiral notebook that I put all the passwords in, but lately I feel that I need to change all my passwords. Its that time of year I guess. Thank you for the share. Nice printable password sheet. It was easy to print out. Thank you. I like that you added a separate column for email used along with the amount of color. It saves on my ink. This is exactly what I need. So simple and yet I can never remember/find mine. Thank you! This is really nice and a great way to have all of your passwords at your fingertips. I have been using 3×5 cards in a 3×5 filebox that has alpha dividers. This works great at home, but is a pain when I need them when traveling. The list should be most helpful. I am trying to print this and am not receiving on my email. Can you help me.